Nathan Redmond was in top form against Liverpool on Friday night, and the Southampton man even turned on the style with some great skills too. The Saints took an early lead through Shane Long before Naby Keita found an equaliser before half-time to set up a fascinating second half. Redmond was undoubtedly a big part of Southampton’s success in the final third, as he continued to cause countless problems down Liverpool’s right flank, with Jurgen Klopp even forced to bring on James Milner to replace Trent Alexander-Arnold at right back. 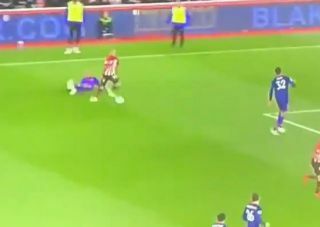 However, as seen in the video below, Fabinho was tasked with getting across to deal with the pacy winger at one stage, but he failed miserably as Redmond managed to nutmeg him, drop him to floor and continue to race clear towards the heart of the Liverpool defence. Luckily for the Brazilian ace, it didn’t lead to a goal, but the Reds will need some late inspiration if they are to return to Merseyside with all three points on Friday night while Fabinho won’t want to see the replay of this in a hurry.